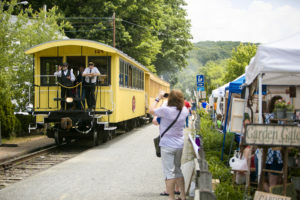 New this year to the Glen Rock Arts & Brew Fest: STEAM INTO HISTORY will be running mini-excursion train rides for only $10 from Glen Rock to Larue and back to Glen Rock! This is the first time Steam Into History has been able to partner with the Arts & Brew Fest and we’re excited to have them join us throughout the day on Saturday, June 2nd! If you ever wanted to ride the train, now’s your chance to get an introductory feel for what Steam Into History has to offer with their longer excursions year-round! Online sales have ended, but you can still get tickets at the event for the brew festival and for the train! Cash is encouraged as the internet can be tricky in Glen Rock, so please plan accordingly! See you there!